To trip the light fantastic is to nimbly dance and on a cool night in June that is exactly what ONEWORLD did on Sydney Harbour to the lights, sights and sounds of the Vivid Festival. 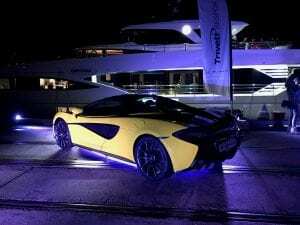 Ocean Alliance, in conjunction with Trivett Bespoke and Robb Report, hosted a select group of clients for a night time cruise of Sydney Harbour under the full luminescence of Vivid. 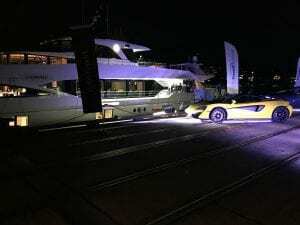 Guests were greeted by a selection of supercars dockside at Jones Bay Wharf for a Mumm Champagne reception before the lines were cast and the 31.5 metre superyacht gracefully cruised out into Sydney harbour. The festival runs for 28 days illuminating Sydney’s icons with dazzling colour. Impressive enough from the land yet onboard a superyacht with a freshly shucked rock oyster in hand, it is quite a thrilling experience. “Yachting in Australia is so much more versatile than other destinations. You can have the seven-day charter cruising the coastline, or, as shown by tonight, you can have an incredible experience in just a few hours. It is unlike any other superyacht destination and I am not sure we know how lucky we are,” said Ocean Alliance’s Managing Director, Joachim Howard. ONEWORLD’s home port is Sydney and is available for charter with a minimum of three hours in Sydney right up to extended cruising in the Whitsunday Island, Great Barrier Reef and even Tasmania. The Vivid cruise lasted four hours and guests were served a sumptuous menu of eight-hour free range Suffolk lamb with salsa verde and mixed grains, smokey pulled-pork sliders with summer slaw and Belgian chocolate hazelnut squares prepared by the yacht’s private chef. “Our collaboration with Trivett Bespoke and Robb Report is a successful one. We all are interested in providing experiences which our clients will remember and cherish, and we would like to thank them for their support,” explained Ocean Alliance’s Charter Experience Manager, Laurie Foulon. To charter ONEWORLD, please contact the team at Ocean Alliance.